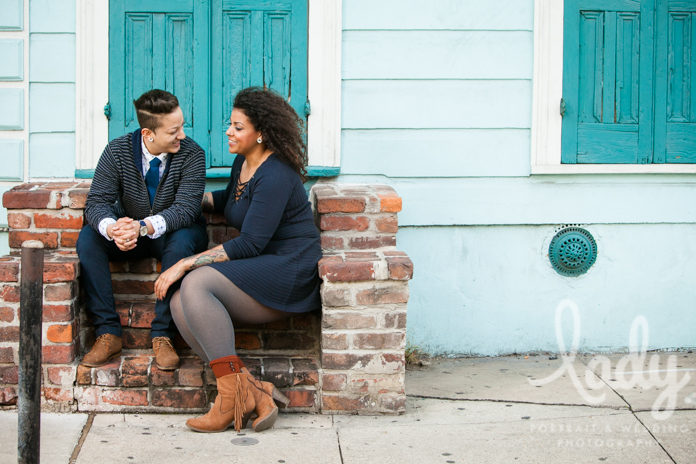 Courtney and Sam: Love in the French Quarter — Lady. “I probably should’ve mentioned this before” Courtney said as I met her and Sam for the first time at Pirate’s Alley. “But there’s a bit of a height difference!” She and Sam got off of their bar stools and I saw that Courtney was indeed a lot taller than her girlfriend Sam! “That’s not a problem!” I laughed. “Every couple is different and there is almost invariably a height difference. I just wish I’d brought my step ladder!” I joked with them as Courtney was also a lot taller than I was! I planned out some poses to get them closer to the same level with each other while they polished off their drinks. But as soon as we started shooting, I saw that getting them eye-to-eye wasn’t even necessary. 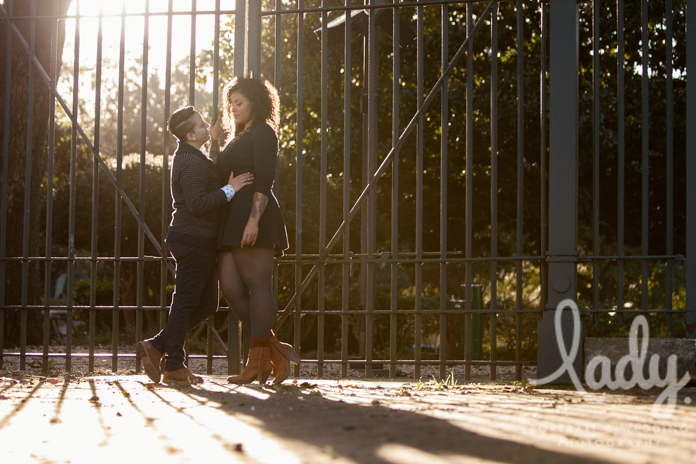 This was the first “couple’s shoot” that I’ve done. I usually only work with couples who are getting married or are celebrating an anniversary. Courtney and Sam were taking a quick weekend getaway to New Orleans and Courtney wanted to surprise Sam with a shoot to celebrate their love. I’m so glad they reached out! 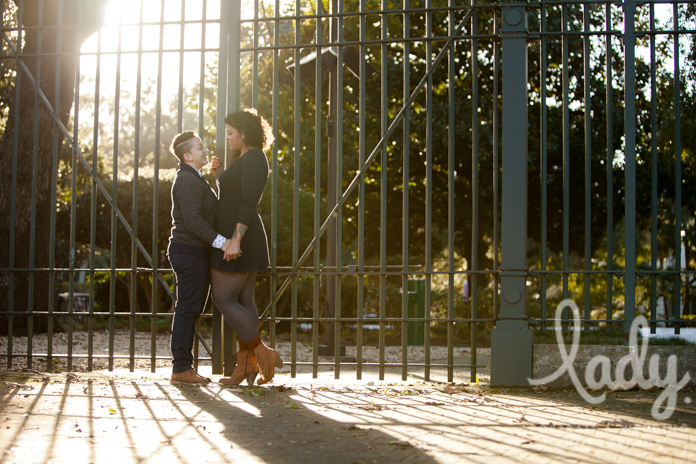 Within minutes of starting our shoot, it was obvious to me that theirs was definitely a love worth celebrating. Sam looked at Courtney as if she was the most beautiful woman she’s ever seen; and while stunningly beautiful, Courtney seemed sweetly unaware of it which only added to her beauty. She looked back at Sam with the same adoration. 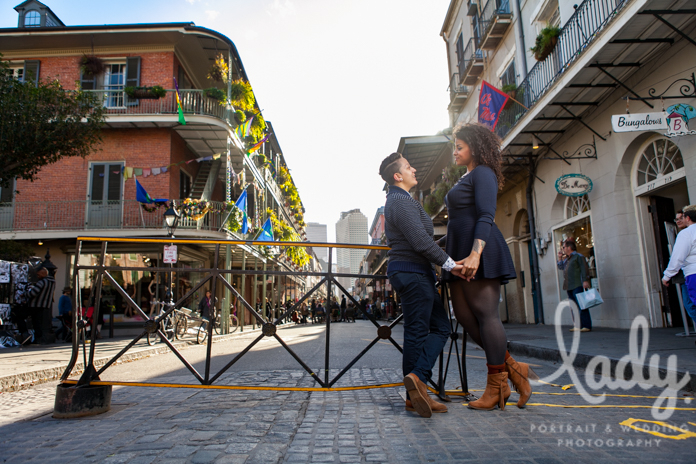 We cruised around the French Quarter together on what was an extremely windy January day. I really enjoy taking my time moving around the Quarter with a couple, picking out stoops and facades that speak to us. As obnoxious as the French Quarter can be (and we definitely encountered some of that outside of Preservation Hall! ), its beauty is simply unmatched and makes for a perfect portrait backdrop. I lost track of time while we were shooting and a one hour session turned into nearly two. 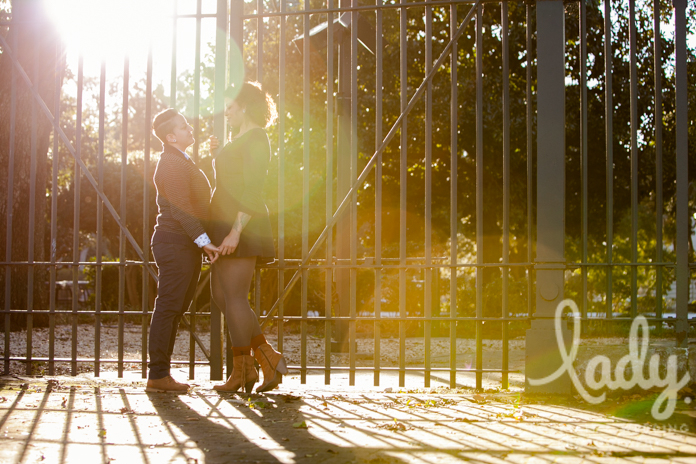 But we were rewarded with this stunning backlight outside of Armstrong Park that I could not get enough of. 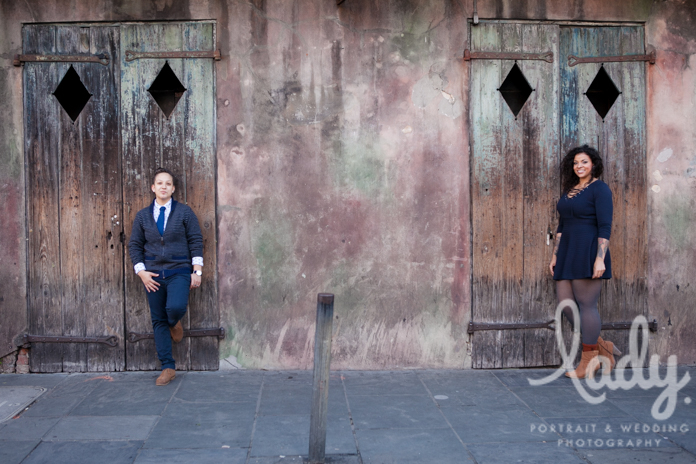 For a New Orleans Portrait Photographer, that was the absolute best finish to a shoot.